Everyone that knows me knows I adore the New Yorker...some of it is a bit silly but I really love it when a reporter is able to do an in-depth article that includes volumes of research and subtle details that make you really know the subject. For example, last month they had a very detailed and fascinating article about some Serbian diamond thiefs, the "Pink Panthers". It didn't just cover their crimes, but went on to their upbringing, their techniques, the methods of searching for them, and on and on. Most magazines are not willing to give up the space for such depth. 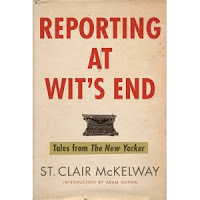 That's why Reporting at Wit's End "Tales from the New Yorker" by St. Clair McKelway, is such a treat for me. 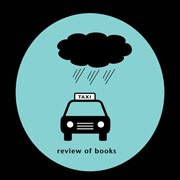 It's a collection of the best articles New Yorker has offered, but in a totally inventive way. 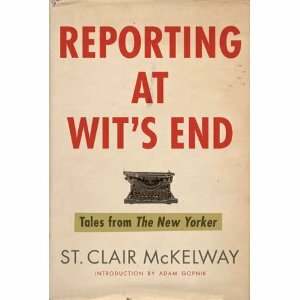 It selects feature articles from different decades, the 1930s, 40s, 50s and concludes with two from the 1960s. These aren't famous people biographies or even well-known articles, just well-written articles about subjects fascinating at the time. One is "Average Cop", a very long study of one of New York's finest, as he goes about his day, from a 1930s issue. Big details and little details are combined to make a complete character study, and it's done uniquely: there's no mockery or subtle elevation of his character. It's just about him. As he is. There's no effort made to push a political agenda or disclose social ills. It's a simple story about a man, and it's fascinating. From the 1950s, an article called "The Rich Recluse of Herald Square" about the death of an elderly hoarder, and her mysterious life. Little details make it painful and tragic, and yet there's this strange sense of power that this woman and her sister had, in order to put the world in its place (and out of theirs). Little pictures of human kindness abound. This is a great collection, and one that I personally enjoyed very much. I thought it was interesting to see the changes in writing and social details between the decades discussed. What was considered improper in the 1930s is handled without note in the 1960s. A great supplement to American history for the 20th century. Thanks to Kristina Jutzi of Bloomsbury for the Advanced Reading Copy. Sounds like a worthwhile read. Who am I? Just for Fun!